The day I received the large package that contained this gorgeous coffee table book, I had Debra, who blogs at Girl With Camera at my house. We oohed and aahed the minute we opened the package and began looking through this impressive book. 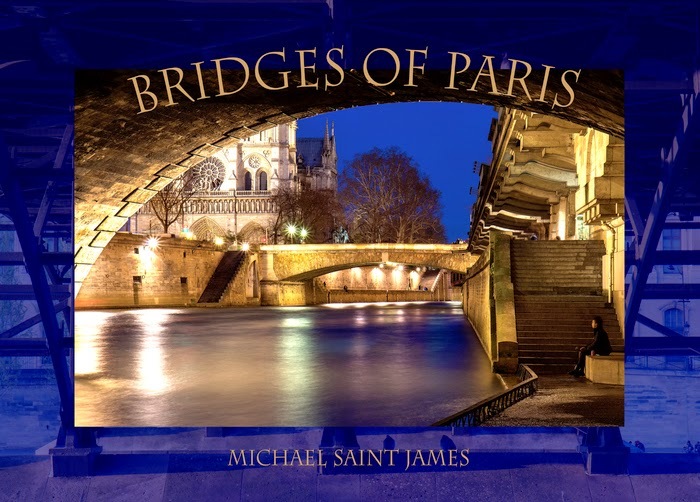 The 14 X 9.5 inch book is large, heavy, and filled with 355 original stunning photographs of the 37 bridges of Paris from different positions and times of day. All the photos are in full color. If you've never been to Paris before, like me, you are going to want to hop on a plane after reading this book and enjoying these photos. I'm very visual, so the first thing I noticed was the layout. This is a big book and some of the photographs are two page-spreads, giving the reader a beautiful large panoramic view of the bridges. The author does book designs and we can tell he is good at it because this book is well laid out, from the choice of colors to the way the photographs just jump out at you. 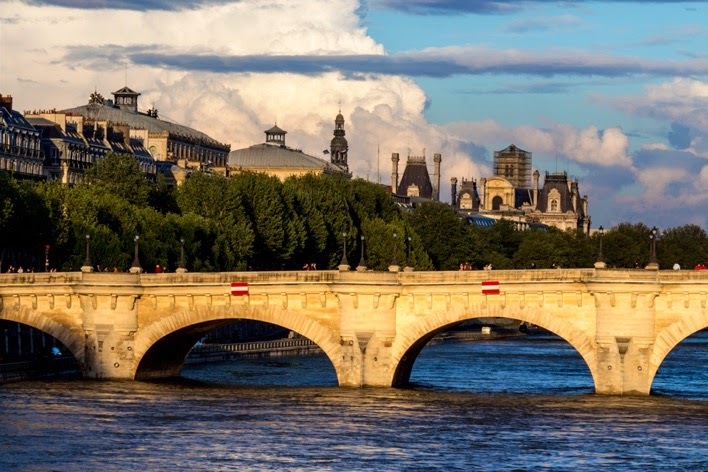 The author focuses on 37 bridges that cross the Seine, even though there are over 300 bridges in Paris! Michael spent a whole year in Paris just to get to know each bridge more intimately and to be able to photograph them in all seasons. Truly, this book that documents the history of each bridge and displays them at various angles and in daylight and nighttime, is a labour of love. But it's not just about the bridges, it's also about the people who cross them and have them as part of their lives. So I kept this book handy in my house and both my parents who were born and raised in Italy, loved looking through it when they came over for a visit. My husband translated the text (my parents read only Italian and French) and they spent a few hours just admiring the beautiful photographs. My Dad especially, who loves architecture, called it "un capolavoro". A masterpiece of a book. My husband, a history buff, loved that the book detailed historical aspects of the bridges. The Palace bridges were my favorite. My kids too, looked through it with me, and they said it was a cool book. 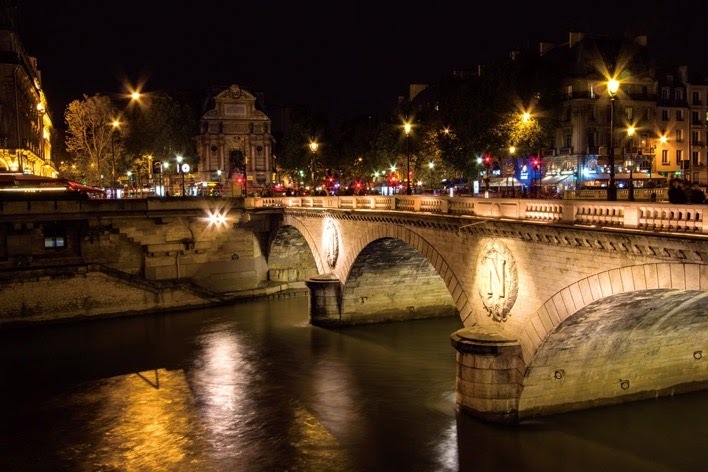 My daughter liked the photographs of the bridges at night (I did too) and my son thought the mascaron faces of the gargoyles on the Pont Neuf were cool. The love locks, of course, caught all of our attention. This is something I did not know about Paris. There is also a handy index in the back of the book for reference. This book would make an awesome gift for anyone who loves Europe, but especially travel enthusiasts, those who admire good photography and architectural structures, and history buffs. It would be a great book to sell in museums and gift shops. 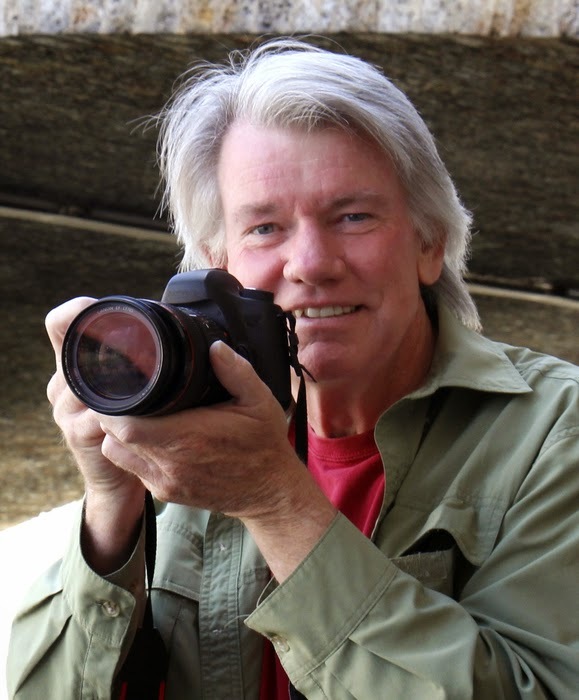 It would enrich the library of any art and photography school as well as any local library. This book is a treasure. To read more reviews, please visit Michael's page at iRead Book Tours. Watch the book trailer. It's worth it.